ESRI researchers participated in the 26th International Reconceptualising Early Childhood Education Conference held in Copenhagen, Denmark in October 2018. The conference topic this year was Inequality in Early Childhood Education and Care. This year it was the strongest representation of Manchester Metropolitan University at a RECE conference to date, so it was a rare chance for us to both hear more about each other’s current research as well as to build on our collaborative networks. As a result of our work at the conference, multiple new and exciting opportunities have emerged for our on-going research. The conference itself offered plenaries in the mornings followed by parallel sessions, which removed some of the formality. The atmosphere was friendly and supportive, with informative discussions after each panel that offered constructive peer assessment. The Manchester Metropolitan contingent included Lisa Taylor, Headteacher from Martenscroft Nursery School and Children’s Centre, who gave a paper with Ian Barron, Professor of Early Childhood Studies, called ‘That roar which lies on the other side of silence’: critical and creative engagement with UK government policy regarding educational provision for two-year olds. Their paper presented findings from the 2-Curious Project, longitudinal research that involved professional development sessions and follow-up interviews with staff from early childhood settings and has illuminated the complexities in challenging hegemonic ideas about two year olds and their families. 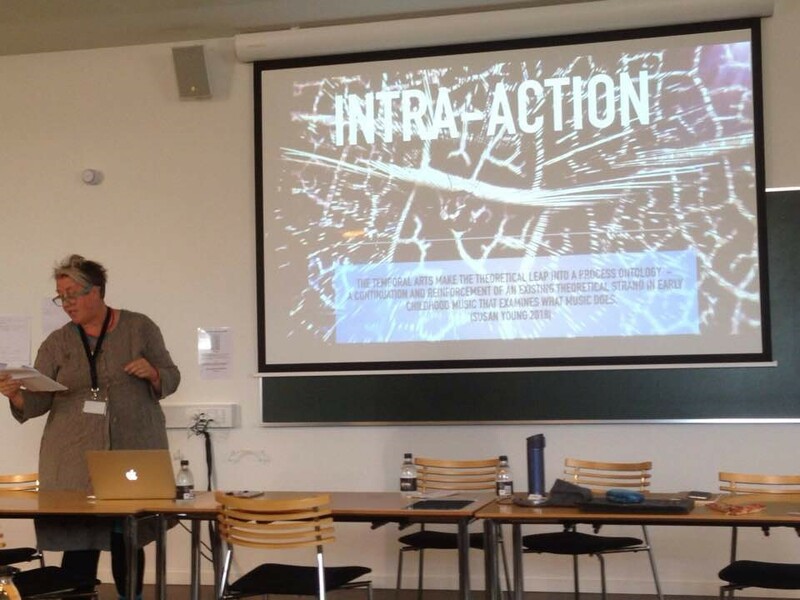 A panel convened by Dr Laura Trafi-Prats, Senior Lecturer, was chosen as a plenary panel. 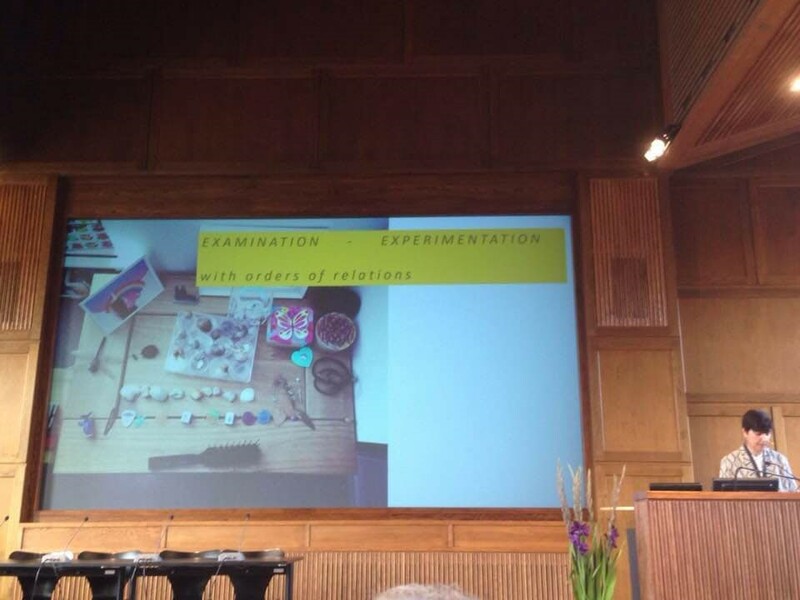 It included papers by Dr Trafi-Prats and Dr Abigail Hackett, Research Fellow, alongside Christopher M. Schulte, Assistant Professor of Art Education and Early Childhood Education at Pennsylvania State University. 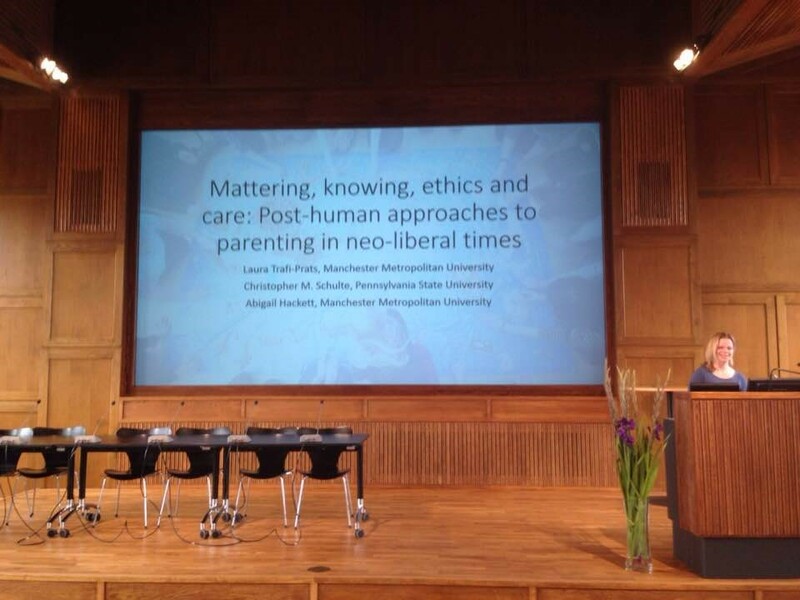 The title of the panel was Mattering, knowing, ethics and care: Post-human approaches to parenting in neoliberal times. It explored everyday parenting experiences through “materiality, emplaced knowing and children’s and adults’ sensory engagement with places” (Hackett, 2017). Working against neoliberal conceptions of good parenting that characterise current parenting policy, the panel challenged a normative language that targets minority, immigrant and working-class families, and the prioritization of economic return over issues of ethics, democracy and social justice. 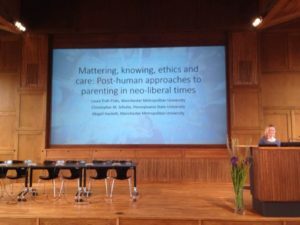 Dr Trafi-Prats’ paper was entitled Thinking-doing parenthood with a posthumanist ethics of care and being alongside other kinds. It sought to mess with the assumption that parenting is a human to human relation about becoming human, and ask what else can be thought and done in parenting when it is considered through the troubling of the human and animal division developed by feminist science studies and posthumanist ethics of care. Dr Hackett’s paper was called Inchoate literacies; leaking, entwining, messy ways of parents and children being in the world. It considered the role of words and articulation within parenting practices, and wondered about the potential for young children’s literacies to foreground entwining, leaking and refusal to articulate as modes of being in the world. 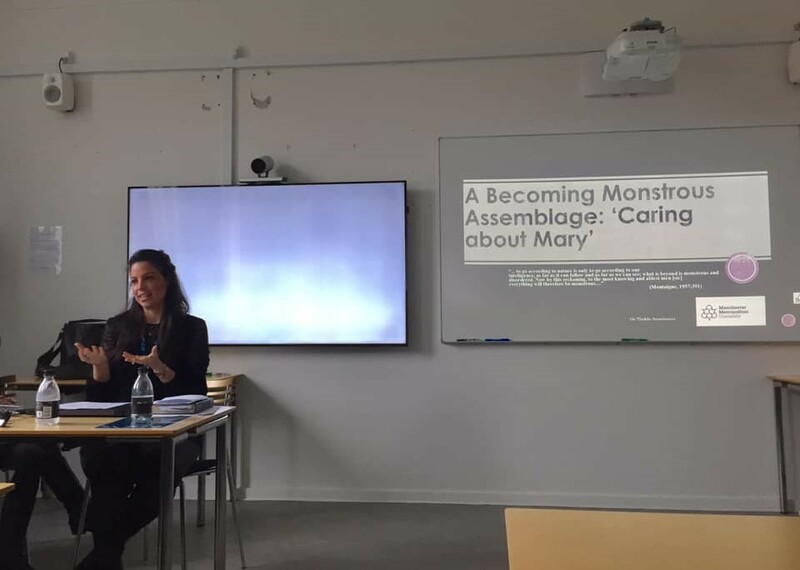 Dr Christina MacRae, Research Fellow in ESRI, and Thekla Anastasiou, Lecturer in the School of Childhood, Youth and Education Studies, organised a symposium with Teresa Aslanian from Oslo Met. University called Rethinking care: care-matterings in the Toddler Room. There was a common motivation across the three papers to think about ways that care is entangled with the non-human in the nursery classroom. When care is only located within the adult-child dyad, an emergent ethics of care-mattering is overlooked. Our panel opened up the notion of care as something less stable, more diffuse and distributed across both human and non-human. 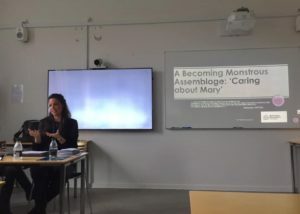 Thekla’s paper was based on her doctoral work and was titled A Becoming Monstrous Assemblage: ‘Caring about Mary’. 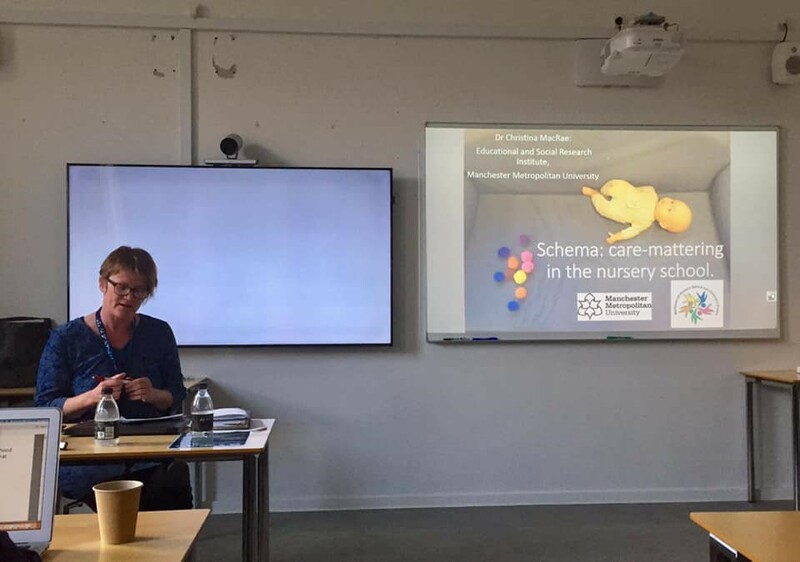 Christina’s paper was titled: Schema: care-mattering in the nursery school, and used data from her current longitudinal ethnographic research project in a classroom for two-year olds called “The Sensory Nursery”. 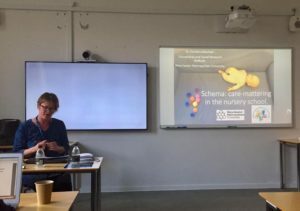 Dr Martin Needham, Associate Head of the School of Childhood, Youth and Education Studies, gave a paper in a session on new materialist and posthumanist perspectives in studying children called Building memory and communication in body and mind. He presented findings from an evaluation of preschool children’s and practitioners’ responses to introductory movement sessions delivered by football coaches in early years settings, and the importance of body movement to the development of cognition. 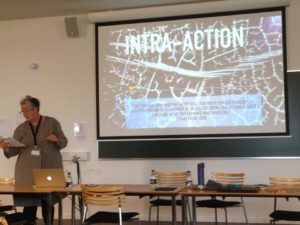 Charlotte Arculus, ESRI White Rose Doctoral Student, presented a paper as part of an early years arts-based panel: Actual children, unique situations: improvisation and immersive pedagogy: A collection of vignettes from a collective of artist-educators. Her paper foregrounded the practice of improvisation, as well as attending to the affective role of both the materials, space, and sound created through an immersive environment, and explored the absence of adult speech and the possibilities that this non-representational space opens up for very young children. At the RECE Business Meeting, recognising the strong theoretical contribution made by Manchester Met to the RECE community, we were invited to submit a proposal for Manchester Met to host the RECE Conference in 2020. This invitation was welcomed and supported by our Faculty of Education and a proposal will be submitted by the end of November 2018. This entry was posted in Uncategorized by CatrionaWicker. Bookmark the permalink.